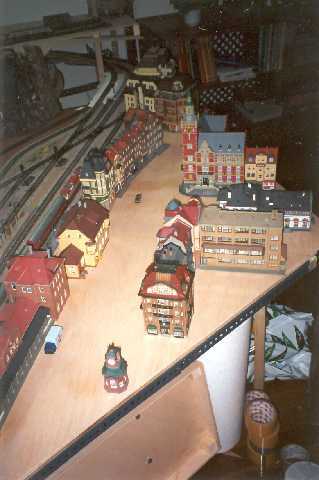 The city (Of any german origin) is situated on the perimeter of the layout, instead of in the center. This gives the advantage and liberty in the design of the city to create the illusion of wide roads and plazas, without being obligated to actually make it all fit inside a small layout. Wether our design is optimal or even any good I will leave for others to deside, but we (my wife and I) sure had a lot of fun trying different designs on the living-room floor, until we came up with this "super-optimated" design. However, constructing the city on the outside of the layout does have the disadvantage of being a lot more difficult to implement for example street-railcars, or even a Faller Car System, because the trains/cars have nowhere to "hide". All figures are handpainted by us. Sorry about the loss of focus in the picture(s). 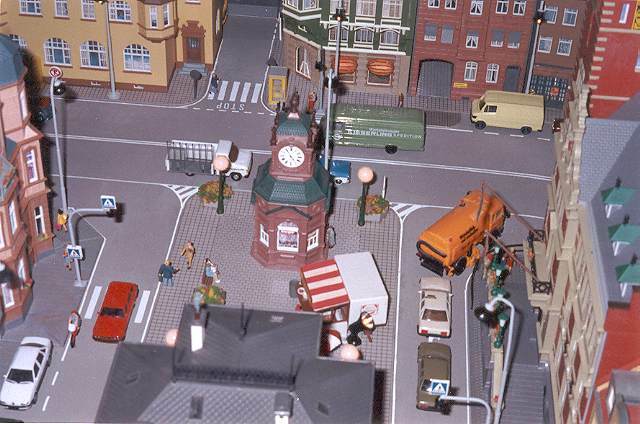 More than show all of the smaller details I hope that at least the photos show the realistic layout of the city. The last photo shows the probably biggest mistake with this city: The lack of realistic "dirt". The wear and tear of a busy mid-german city is totally forgotten here, and the city is left with a totally unrealistic plastic glare. Here is a videclip of the backstreet running along the tracks of the station. This is a neighbourhood that cant be seen on the above photos. Clip is in RealPlayer format.